We see a lot of PDFs come through the MagCloud site, and while most of them look great, there are some avoidable issues that pop up every so often. Below are ten common PDF problems that can stand in the way of a great looking print publication. 1. Content is too close to the outside edges. We see a number of great PDFs that have text placed dangerously close to the trim line. As we discussed in our design series blog post on trim and bleed, it’s important to keep your content within a safe distance of the trim line to avoid having it cut off in your final print publication. Remember that the trim line is 8.25″ x 10.75″ so you need to design to those dimensions NOT the PDF size of 8.5″ by 11″ that you upload to MagCloud. This 8.5″ x 11″ PDF includes a bleed area that will be trimmed off: 0.125″ on the top, 0.125″ on the bottom and 0.25″ on the outside. Since this trim can vary slightly in either direction, we recommend leaving 1/4 inch of extra space between the 8.25″ x 10.75″ trim line and your content, particularly any text content. This will ensure that even if the trim is slightly off, your content will not get cut off, nor will it appear to have been placed too close to the edge of the page. 2. Images are not extending into the bleed area. Similarly, we see a lot of PDFs where images that the publisher wanted to extend to the edge of the page stop at the trim line. If the trim is even slightly off in the opposite direction in this case, there will appear to be a thin white edge on the image, as shown in our trim and bleed blog post and below. With that in mind, be sure that any images you want to extend to the edge of the printed page, go all the way to the edge of your 8.5″ x 11″ PDF, filling the bleed area (again, 0.125″ top and bottom, 0.25″ on the outside edge). 3. Content is too close to the spine. Another “edge” to keep in mind is the inside edge of your PDF, where the spine will be on your printed publication. We often see PDFs with text that starts right next to the spine, and becomes lost when printed with a perfect binding. As we described in our design series blog post on designing for perfect binding, up to 1/4 inch of the inside edge of your page may be lost into the spine on a perfect bound publication. It is important to keep this in mind when designing your PDF, and ensure that none of your content is placed close enough to the inside edge that it is in danger of being lost in the final print. 4. Images are distorted across perfect bound spines (especially faces). In addition to text disappearing into a perfect bound spine, we also see PDFs that have images going across the center spine such that the resulting print appears to be missing up to a half inch in the center of the image due to the perfect binding. As described in our perfect binding blog post, as well as on our Getting Started page, this can be avoided by making the two halves of one image into two separate images within the document, then moving them both out from the spine slightly and duplicating the opposing image within the resulting gutter space. Another trick is to avoid placing the focus of an image on the spine, which will draw attention to this disappearing act and make it more obvious to the viewer. If the focus is moved away from the center spine, any loss of content into the spine area will be less noticeable. 5. PDF uses low resolution images. While the placement of images is one thing that can cause problems in a print copy, the image itself can be the problem. We often see are PDFs that use lower resolution images, and although they look good on screen, they end up looking pixelated in print. As we describe in our design series blog post about getting the most out of your images, screen resolution is 72 pixels- or dots-per-inch (dpi) but print resolution is 300 dpi. Therefore, when selecting images for your publication, they should be at least 300 dpi to ensure a quality print out. As a test to see if your images will look good in print, open your PDF on your computer screen and zoom in to 300%. If the images still look crisp then, they will look good in your printed copy. On the other hand, if they look pixelated (like they are made up of little blocks of color) then your image is too low res, and will end up looking fuzzy in your final printed copy. 6. Color profiles are not embedded. Another common image problem we see in PDFs deals with the color of the resulting print copy. As we explained in our design series blog post on working with color, HP Indigo presses print MagCloud publications in a 4-color CMYK process, but most images that get used in the PDF have an RGB colorspace. To help guide this conversion from RGB to CMYK, it is important that the color profiles for these images are embedded in the PDF. Without them, the color of the printed images may appear to be slightly off. To make sure that you are using the best color settings possible when creating your PDF, we encourage you to follow the program-specific instructions that are available for download from the bottom of our Getting Started page. 7. Fonts are not embedded. Of course, color profiles aren’t the only things that need to be embedded in your PDF – any fonts you use also should be included. A common error that occurs in our PDF upload validation is non-embeddded fonts. This can again be avoided by following the downloadable instructions on our Getting Started page for the software you are using to design your PDF. Each of these guides provides settings that will ensure your fonts are properly embedded in your final PDF, and help you avoid this upload error. 8. Fonts are too small or illegible. In addition to the technical issue of non-embedded fonts, in some cases the problem with a PDF stems from the fonts themselves being too small or illegible, making the text difficult to read in the final print. For body copy we recommend 9-12 point type and for headlines 18 points or higher. As we discussed in our design series blog post on typeface dos and don’ts, you also want to avoid hard-to-read fonts, particularly for large blocks of text. Decorative fonts are great as headers, but can detract from your message when they become difficult to read. 9. Dark text is used on a dark background, or light text is used on a light background. Even in cases where the font is legible, we’ve seen PDFs where the color of the text doesn’t provide enough contrast with the background. Placing navy blue text on a black background or light yellow text on a white background, as shown below, becomes very difficult to read. When there is not enough contrast between the text and the background like this, the text seems to blend in and disappear from view, taking the message it was intended to convey with it. 10. A light spine is used with a dark cover, or a dark spine is used with a light cover. Finally, while you want your text to stand out, it’s a whole other story when it comes to your spine. We occasionally see PDFs that have dark covers and light spines, or vice versa, which makes the slightest shift in the spine placement become glaringly obvious. As we discussed in our perfect binding design blog post, we encourage you to pick a spine color that is close to the color of your front and back covers. Doing so will give a more seamless appearance to your final print publication, and ensure a more polished look with every print. To help avoid these problems in your PDF, be sure to follow the program-specific instructions available for download on our Getting Started page when designing your publication. For some more resources to help design your PDF, check out our design series blog post on layouts and templates, or browse through some of our featured publications on the MagCloud website for inspiration. Does your publication successfully avoid these ten common problems? Share a link to it in the comments below! Maybe its a side effect of Pinterest, and all of the beautiful weddings we keep seeing pop up, but with June being one of the busiest months of wedding season, we couldn’t help but get into the spirit and explore some DIY wedding ideas using MagCloud products. It all started last month when I created some fun custom bachelorette invitations for a getaway weekend for my friend who is a bride-to-be. Using MagCloud’s digest pamphlet product I designed a fun little invitation that fit into the top 5.25″ of the template. 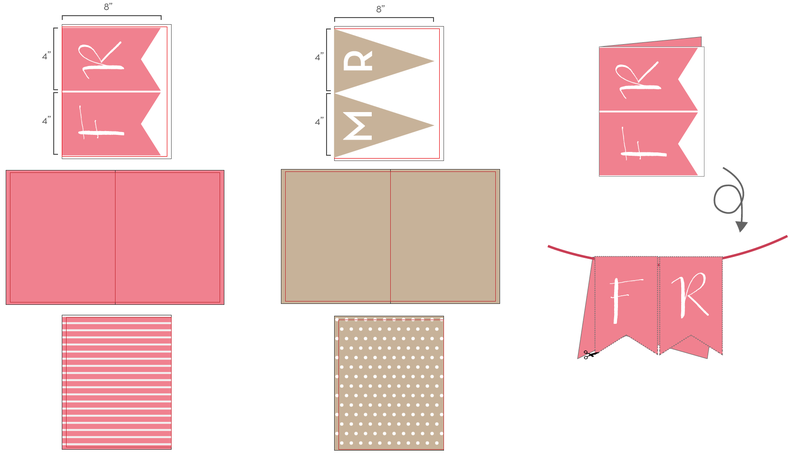 When the prints arrived (each cost just $0.64) I took a quick snip with my scissors and popped them into coordinating 5.75″ x 5.75″ square envelopes that I found at Paper Source. How else could you use MagCloud products for wedding DIYs? Whether you have 12 bridesmaids or 2, having a nice wedding program helps keep guests informed of the order of the ceremony, and who you’ve cast in the important roles for you big day. The four-page digest pamphlet–or if you have a lot going on and want to include songs, readings and hymns–a digest-sized 8-page booklet are classically styled and beautiful printed. We also tried using the square pamphlet for a more modern feel. Depending on the form factor you choose, and the quantity you need, a 4-page digest or square pamphlet could cost somewhere between $0.48 and $0.80 a piece, perfect for the bride on a budget. Using our flyer product to create a sleek menu was really simple too. By dividing the page lengthwise (basically creating a 0.5″ gutter right down the middle of the page) we were able to print two menus per flyer and simply cut them in half with a paper cutter when they arrive. Because our flyers cost just $0.40 print (or buy at least 20 and the price drops to $0.30/print), printing two per page makes them$0.15-0.20 per menu. That means you could print 200 menus for just $30.00 + shipping. *Note: Flyer publication orders are subject to an 8 quantity minimum in multiples of 4. The wedding poster seems to have surpassed traditional guestbooks in recent years as the popular way to commemorate one’s wedding day. Rather than being stuffed into a box and never looked at again, the wedding poster allows newly-wed couples to enjoy the love notes and encouragement given to them by family and friends for years to come. MagCloud’s 12″ x 18″ poster costs just $2, leaving you plenty to spare for a fancy frame. We recommend having your loved ones sign a mat (like this one available from Amazon) rather than directly onto the poster (UV coating which protects the poster, also makes some inks smudge). But if you really want to let folks sign right onto your print, we found that you can do so with Sharpie Metallic Fine Point Permanent Markers. Get started creating your own! For more design guidelines for our poster product, visit our Getting Started page. With the “Rustic Chic” style of weddings still ever-popular– pennant or flag signs have become a wedding or shower must-have. We’ve seen every variation from “she said yes” to the classic “Bride” and “Groom” signs on the backs of chairs, and found that the MagCloud standard pamphlet is a great tool for creating your own. With two letters per pamphlet we were able to create this sign for just $6.40. Using fishing line, twine or a narrow strip of ribbon and a glue stick, we simply cut out the pennants, lined the ribbon up in the fold of the paper, and glued the two sides together around it. The 100# cover stock used in our pamphlet product helped the banner hold up in a nice afternoon breeze. Interested in creating your own event DIY with MagCloud? Now that you’re in the wedding mood, check out some of our favorite publications in the Brides & Weddings Section of the MagCloud Shop. Today’s post is from designer and MagCloud publisher Jennifer Koskinen, owner of Merritt Design. With a desire to start the year with a positive outlook, Sandy Puc just began a great discussion thread on LinkedIn asking people to think about the Top 10 things they believe contribute to a successful photography studio. I love taking the first week of January to revisit goals for my photography business, and so was inspired to take a moment to reflect on my overall strategies for success. In no particular order, here are my Top 10 (ok 12) things I have observed over the years which motivate me every day. Some I live with confidence. Others I am still working to make wholly mine. What would YOU add? Make booking, scheduling, delivering, and of course, shooting the photo session a memorable and fun experience. Inspire referral business through existing clients. Yes, you. Genuinely. Smile!! On the job … and at the proverbial coffee shop (can’t even count how many clients I’ve earned with this philosophy). Keep reading, networking, attending seminars and workshops, stay abreast of current trends, and try new things based on what inspires you. Keep business and personal deadlines, and self-impose deadlines for non client driven ones. If you keep pushing back a deadline, ask yourself if the item should really be on the list (if so: do it! If not, remove it or put it on a separate back-burner list). Schedule regular activity and think outside the box to market yourself creatively (in print, in person and via social media) Your website should reflect your personality. And especially when you’re starting out, don’t show every photo, show only your BEST photos! Push it! Often! Shoot new material. I love to use my phone camera to shoot personal projects even on days when I’m not shooting for clients. Review cost of business and package pricing annually and always communicate clearly and confidently with clients (unless you happen to love negotiating — which I decidedly do NOT — printed materials with pricing menus help tremendously). Fall in love with the business side of what you do. This is still my biggest challenge. I had to finally design myself a beautiful system of spreadsheets because the available software systems were all too dry for me. May sound silly, but it works for me. Find what works for you. Know and continually update your contracts to stay on top of constantly changing on-line world (especially if you work with digital files and licensing). Educate your clients about copyright laws, and gently educate clients that they are investing in your talent, creativity, instinct and vision, NOT paper and ink. Be grateful for the fact that you get to do what you love for a living! Remind yourself of this simple and amazing fact when times are tough. Often. Crazy ones. They are immeasurably good for the spirit. Not to mention sore, over-worked eyeballs. And as part of my “outside the box marketing” I like to use MagCloud to show off my work in print and digital, as well as providing my clients with new ways to market their own businesses. Learn more about Jennifer’s work on her website and see her collection of MagCloud publications on her publisher page. Do you have your own Small Business tips? Share them in the comments section below. Visual storytelling is nothing new in the realm of business. Content consumers love the power of an image portraying “1,000” words that leaves enough to the imagination while alluding to a larger point. To that end, MagCloud is running a #MagCloudHearts themed poster giveaway through Instagram. But what makes Instagram an improvement over the time-tested and standardized visual element? To answer these questions, we continue our chat with Cory Ann Ellis and Trey Hill. This time, we’re shifting our focus from Pinterest to Instagram, and the best practices for leveraging the platform for publications and small business. MagCloud: Are your businesses using Instagram for business purposes? Cory Ann Ellis: Yes we are on Instagram (@coryannellis), and like Instagram for private use, it’s immediate and visual nature. It is free and clear of long posts, soapboxes and other negatives that can fill other social media platforms. Trey Hill: My agency (@squarerootof9) specializes in image driven storytelling, and for most people, I am the agency. I’m an avid Instagrammer & use it to tell my story, which spans the professional, experimental and personal. MagCloud: What’s your favorite element of Instagram, and why do you think it can help your publication? Cory Ann Ellis: Instagram has the ability to show a steady stream of interesting content that can keep the reader’s attention between publication dates. With behind-the-scenes and feature teasers, viewers can get excited to pick up or download the next issue. Trey Hill: It’s a craft that’s always been about contextualizing and sharing our world. Instagram, for me, has made it so the time between seeing and sharing is almost zero. In that way, I think it’s perfect. Used well, Instagram can help anyone craft an ongoing story that reveals who you are and what you’re about. Just because you’re on a mobile device doesn’t mean that you can’t take time to learn the craft of photography. The tools have changed, but the aesthetic that draws people to a photo – good composition, proper exposure and a unique point of view – will never change. MagCloud: What are your top Instagram tips for publishers? Cory Ann Ellis: Show images that are graphically interesting and fun. Go easy on the filters. Focus instead on the framing and lighting so that you don’t need to use filters to distort from poor photography. Yes it’s just a camera phone, but you can use it wisely. Try hinting at an upcoming article by showing a tiny detail or abstract from the set without showing full setups. In Part Three, I talk about how to push the medium of Instagram by highlighting something I created called #panogramtastic. 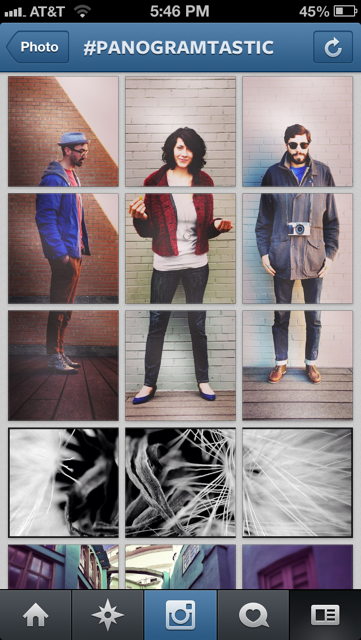 Basically, Instagram is all about the single square image. For a while, people have been using apps to add white to the background of their images so they can post circles, or more traditional photo crops. I thought, “What if you could take the constraints of the app and use them to create something interesting?” I began by using my profile’s grid view to merge a single panoramic image across three frames. They come out like what you see on the left. MagCloud: How best can publishers promote their publication using Instagram? Cory Ann Ellis: I think one of the best ways is to use the hashtags to create contests or followings for a specific feature or event. For example, if you create a hashtag and promote the most recent publication by saying, “Where do you read your xyz magazine? – show us through Instagram. Hashtag your photo #xyzmagread.” Then you have a steady stream of everyone reading your magazine in different places and parts of the world. These can be fed into your websites, blogs and even shared on Facebook. This is a great way to show that others are enjoying your publication and they might also. Trey Hill: One of my clients is the Dallas Stars, an NHL hockey team. One of the initiatives we’ve done for the past five seasons is inviting the fans behind the curtain. I think Instagram is perfectly suited to show people the raw, unpolished parts of who you are. Fans love it because they feel like they are part of the team. For a publication, I would say, use Instagram to show people things they wouldn’t otherwise see – an image that didn’t make the final edit, but is still evocative – a layout sketch or anything from the process. Just because it’s not “for real” don’t let that mean you don’t treat it with respect. Make sure you take time to art direct the frame or fuss over the treatment you put on the image. It may not be part of the publication, but every Instagram becomes part of your story. We’d like to give both Cory and Trey a special shout-out and thank you for showing us some of the magician’s tricks, so to speak. Do you too have insight into how Instagram improves the story-telling strategies for your business? Let us know in the comments, and don’t forget to join the #MagCloudHearts Instagram poster giveaway! If you’re not already following @HPMagCloud on Instagram, you should be! We love to engage with our publishers and see MagCloud publications and products out in the wild–how you use them, where you enjoy them and cool pictures of your work coming together… So when you decide to show off your MagCloud product, be sure to tag us (@hpmagcloud) or use the #magcloud hashtag. In the meantime, we have a few favorite Instagram users we’re following, and some suggested hashtags for when you share the MagCloud love on Instagram.